One of the biggest highlights of SDCC and I almost missed it. As I wandering around the gaslight district with sweat pouring buckets down my face, a friend sent me an alert to my cell that the Her Universe Fashion was starting in 20 minutes. I was blocks but from the convention hall and it was being held at the Marriot Hotel next to it. Dilemma presented, what’s the solution? Pedicab it! Pedi-cabs are used frequently during SDCC. Pedicabs are pretty much rickshaws attached to motorized bikes. The fare can run between $8-$20 depending on where your going. Most of the pedicabs during SDCC will be decorated with promotions or posters. Later on in the week, I managed to ride in a Once Upon a Time-themed pedicab. The cyclists are usually very kind, fun,and some will even pump out music. So began my first venture on a pedicab. It was such a thrill zooming through the streets as he blared out Beyonce “Crazy in Love”. I could not stop laughing! What would have taken me an agonizing 25 minutes due to sore feet, took me less than 10 minutes. Mission accomplished! Now why go through all that hassle for a fashion show? 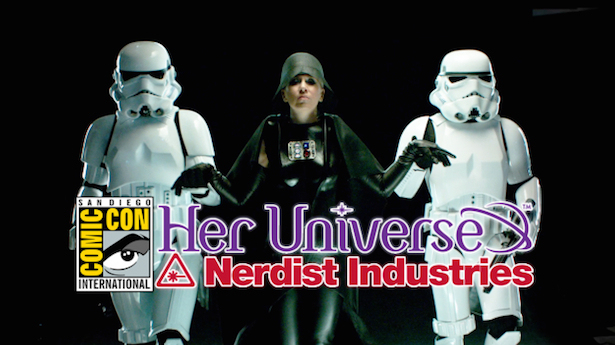 It’s the only fashion show that every female in the geek industry should pay attention to. 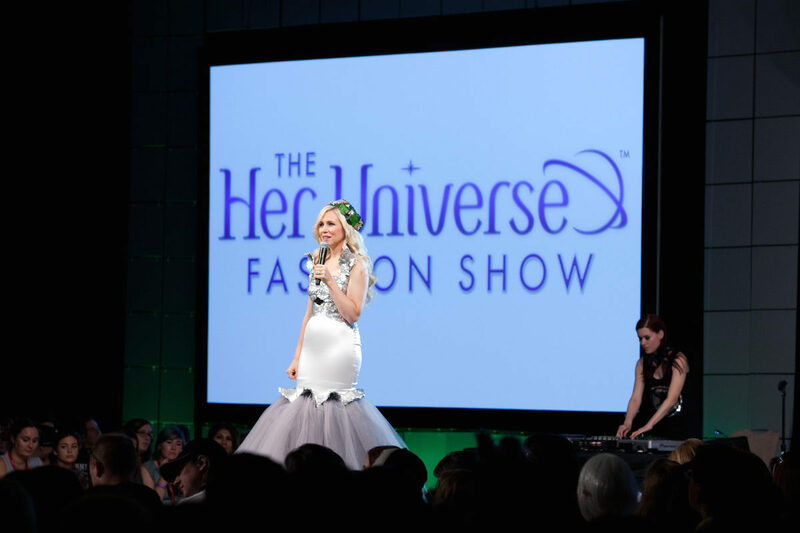 It was the First ever HER UNIVERSE fashion show! It was also announced (with very, very much excitement) that they will be introducing a new brand to the franchise: STUDIO GHIBLI!!!! Some of the models walked onstage with the upcoming apparel and I know for a fact that I will be broke. Very happily broke. Her Universe fashion show set out to present geek couture to another level. 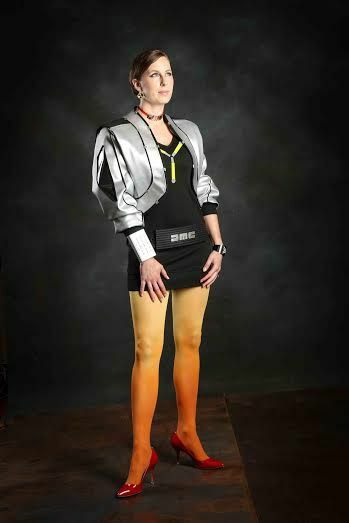 For those familiar with comic convention floors, people have been wearing their own designs of their own geek couture for a long time. Now it was presented on a beautiful catwalk with a chance at creating an exclusive line for Hot Topic store distribution. For geek fashion designers, this was a BIG deal. I lost my voice from cheering so hard for all the talent that walked on stage. Every single outfit was a work of beautiful design. Eckstein even walked out in a custom-made Totoro inspired gown! Beautiful! I’m not going to lie, I felt immensely lacking in my designer skills! There were about thirty or so entries. The show was broken up into several segments with a video-bio preceding the models walking. I truly congratulate every single designer. Your hard work has inspire others to create their own. I wasn’t able to film the event but you can see snippets of the event on various websites. It was co-hosted by Nerdist Industries and I believe they will have some footage. The best video of the event so far is featured below. Her Universe website will also be highlighting each of the designers in the upcoming month. “Nice dress Marty”- dress inspired from Back to the Future. Winner for the event! Of all the dresses, there was one that had me jump out of my seat in shock. I really did jump out of my seat. I believe I startled the girls around me with my enthusiasm. The dress was designed by Andrew MaClaine, from Palm Springs, California. His dress was titled “Regina’s curse” from Once Upon a Time. Being an avid fan of the show, my eyes were glued. The model comes out in the modern version of the evil queen. Beautiful,but not eye popping. It was when she unhooked her belt and she instantly transformed into the evil Queen! It happens in less than 10 seconds and it is phenomenal! Check out the footage, I still have chills. From all the surprise squeals that joined mine, it was no wonder that it won fan favorite! If you’re looking at these photos in envy or telling yourself you could have designed a better outfit, then keep an eye out for the next call of submissions for next years Her Universe fashion show. Start sketching your ideas now! This was an honor to be an audience at the first Her Universe Fashion Show. Whether I am able to attend SDCC or not next year, I will keep my eyes peeled for it!